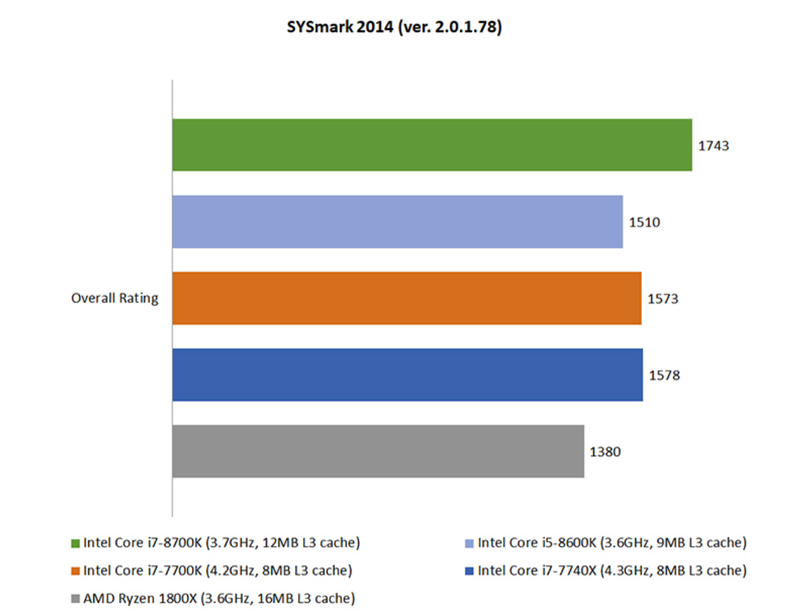 Koh Wanzi at Hardware Zone reviews “Intel Coffee Lake vs. AMD Ryzen: This is Intel’s answer to Ryzen” using BAPCo’s SYSmark 2014 SE benchmark. According to Hardware Zone, “The flagship Coffee Lake CPU was also 26 per cent quicker than the Ryzen 7 1800X, despite both chips having relatively similar base clocks. However, discounting the large gap between the maximum speeds that the Core i7-8700K and Ryzen 7 1800X are capable of – 4.7GHz versus 4.2GHz – it’s worth noting that the Core i5-8600K also managed to beat the AMD chip by about 9 per cent. That’s despite having just six cores with no Hyper-Threading, and a Turbo Boost 2.0 speed of 4.3GHz, not that much higher than the 1800X’s 4.2GHz. As a result, it would seem that when it comes to the applications used in SYSmark, Intel still has the advantage because of its higher IPC. Head on over to Hardware Zone for the full “Intel Coffee Lake vs. AMD Ryzen: This is Intel’s answer to Ryzen” Review here.